Posted on 23/05/2017 at 10:26 am. BETHLEHEM, May 23, 2017 (WAFA) – President Mahmoud Abbas said on Tuesday that freedom and independence of the Palestinian people is the key to peace and stability. 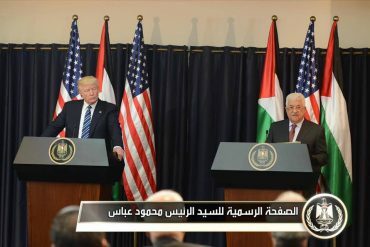 Speaking at a press conference with visiting US President Donald Trump, Abbas said he is committed to a historical peace deal with the Israelis, and to work with Trump as partners in combating terrorism. “My meeting with you at the White House earlier this month gave us and the Palestinian people a lot of hope and optimism to achieve a long-awaited dream of peace based on justice,” he said. Abbas also reiterated his commitment to creating an independent Palestinian state based on the 1967 borders, with East Jerusalem as its capital, and which lives in peace with Israel. “We reaffirm our position on the two-state solution on the 1967 borders – the State of Palestine with East Jerusalem as its capital, to live side by side with Israel in security and good-neighborly relations, and to resolve the permanent status issues based on international law and international resolutions and to honor the signed agreements in a way that would allow for the implementation of the Arab peace initiative, as reaffirmed at the recent Arab summit in Jordan,” said Abbas. The President stressed that the conflict is not between religions but that the problem lies in the occupation and the settlements, in addition to Israel’s non-recognition of the State of Palestine. “As you saw yesterday, during your historic visit to the Holy places in occupied East Jerusalem and today in Bethlehem, the conflict is not between religions. Respecting religions and the prophets is an integral part of our belief,” he said. Speaking about prisoners in Israeli jails who are on hunger strike, said the demands of the prisoners are humane. “On the issue of our Palestinian prisoners who have been on hunger strike for more than a month, a few meters from here near the Church of the Nativity and everywhere in Palestine, the mothers and families of the prisoners suffer from not being able to visit their children. Their demands are humane and just, and I call on the Israeli government to respond to these legitimate humanitarian demands,” said Abbas. Abbas said that achieving peace will help growth of the Palestinian economy. “Achieving peace, Mr. President, will open the horizon for the advancement of our economy and the completion of the building of our national institutions based on the rule of law in the spirit of tolerance and coexistence, the dissemination of a culture of peace, the renunciation of violence and incitement and the building of bridges instead of walls inside our territory,” he said. Abbas concluded his statement by saying that he hopes history will record that President Trump is the American president who achieved peace between the Palestinians and Israelis, adding that he extends his hand to be a partner in this task.